Hi guys! Its been a while since I have written anything on here but I do promise to start blogging a bit more! This pregnancy has been keeping me quite busy. I am very excited to soon meet my baby! Which by the way ITS A GIRL!!! I am due June 20th, 2013! I cant wait I am ready to hit the gym and diet again! I have gained a great amount of weight but am confident I will lose it. With dedication and the discipline to stay focused anything is possible! Let me start off by saying I was inspired to make these by the high prices of ordering already made ones exactly like this. I was looking on etsy.com and saw these beautiful invitations and I needed about 80 of them but when I messaged the maker she replied with the price of 3.25 per invite! I felt that was way to much for my budget so I had to be creative and boy oh boy am I as proud as ever I made them! I spent a total of about 23.00 dollars on the supplies and made 100 invitations! I had my mom help me and we got it done and it was the BEST feeling ever because they came out great and look FABULOUS! Once you have the information you need to be sent out you can put the cloud into the diaper and tie the bow through the slits you created on the front of the diaper. 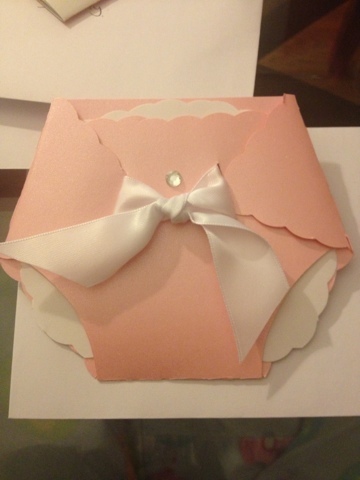 The Final touch will be adding your rhinestone to the top of the diaper where the bow is and WALA you have a FABULOUS baby shower invitation! This is awesome! I was about to buy them also but it was too expensive. 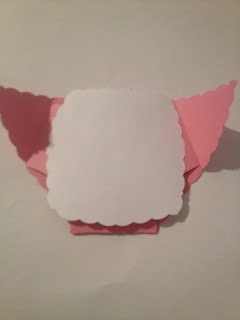 I need about 100 as well.. How many 12" by 12" card stocks did you use? Also if you could help me with the lb of the cardstock.... I'm finding them cheaper online would like to place an order. Thank you in advance. Awesome idea! 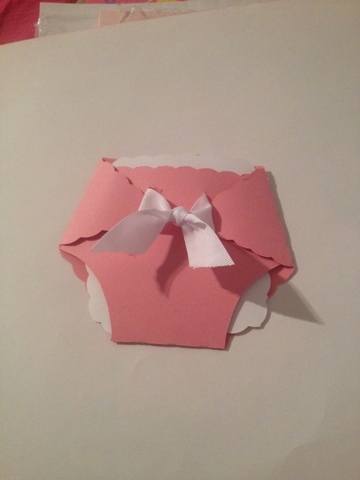 This is really a great DIY for any mother to-be looking to make her own Baby Shower Invitations! Do you have any other tutorials for different cards? Thank you Joan! I am soooo glad its a useful DIY tutorial. I do have other tutorials and have been meaning to post them but have been so busy. I also take requests for tutorials but will definitely post the ones I have so far this week! @anonymous I bought 2 packs of 50 cardstock for about 8 dollars but if you find them cheaper then hey go for it! 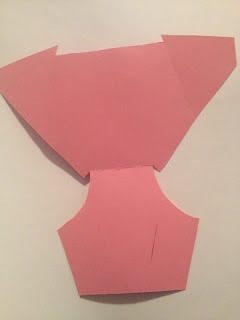 I am unsure of the weight the cardstock but I can check and let you know. Did you use the diaper as the actual envelope or put them into envelopes as well? I put them into envelopes as well. So basically it took 100 of those 12x12 scrapbook papers to make the 100 invites? ^^^100 of the pink papers? Fabulous idea... I have an order in on Etsy and she hasn't been responding so I was panicing that she can't do the invites. You may have just saved me lots of money! Quick ?... From the PDF of the template, it looks like you print on standard size printer paper so I'm confused why I need the 12x12 card stock instead of 8.5 x11 cardstock. Please explain. Im sorry that was a typo I have to edit it to say 8.5 x 11 cardstock. please don't forget to change the 12"x12"! i bought all of this stuff yesterday before reading these comments and had to exchange my 12x12s for 8.5x11s. One of the nic post thanks for share. @alexis it was an additional 20 cents next to the Forever stamp I bought a book of stamps. the template will not open! can you re-post? Your post and template are extremely helpful, I am just confused on how would i do the inside invitation-because it says cloud shaped, i dont know where i would get a template for the inside actual invite, any suggestions? How do you cut it from the template so that the flaps fold over? 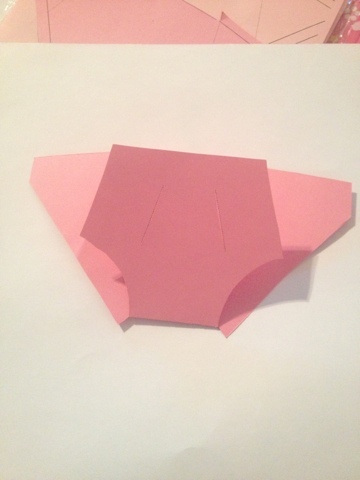 after u trace the template, do you just fold? What size envelopes did you use to mail this invitation? HIII i have a question, HOW DID GET THE PRINT(writing) ON THE WHITE CARDSTOCK WITHOUT ANY INK MESS OR LINES?????? 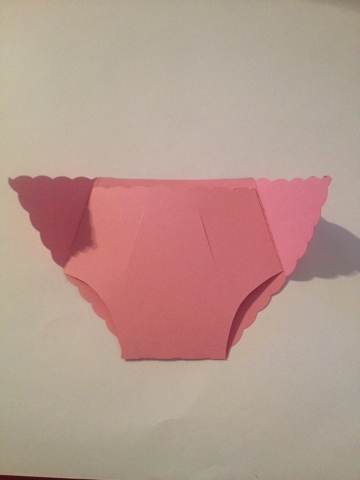 This baby shower diaper idea is really awesome, very unique and the creativity is superb. Your such a creative crafty my dear and thumbs up for you. Keep it up !! Were you able to use a home printer to print onto the white cardstock for party info? Also how much ribbon was used or bought and what length? These little invitations are adorable! You should check out Fashion nappy bags.